Looking for a cute way to give a little something to a friend or co-worker? 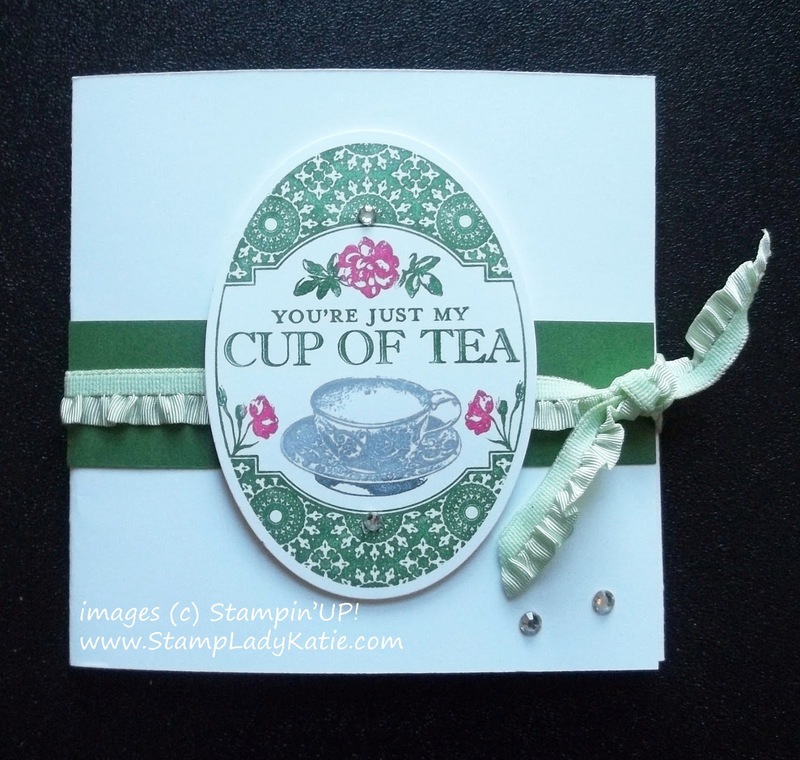 Here's a cute teabag card. It's decorated on the front with images from a stamp set called Tea Party. Available in either wood mount or clear mount. The Rose Red and Garden Green color combination is so pretty. 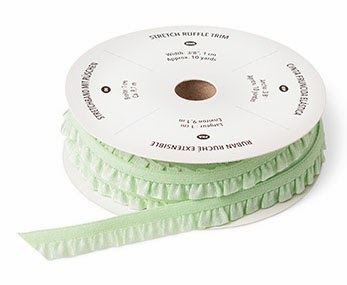 and a cute "belly band" made of Pistachio Pudding 3/8" Ruffle Stretch Trim as a closure. 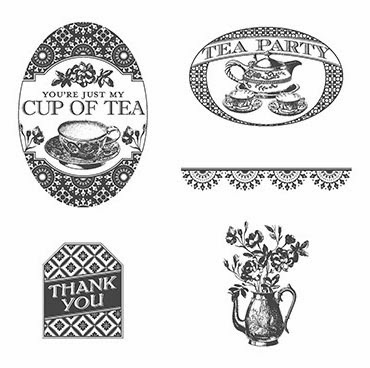 The Tea Party stamp set has some great images. as well as some really cute hello cards. TIP: You may be wondering how I got these different colors, since the image is a single stamp. The answer is to color the stamp itself with markers and then stamp to the paper. This is a large image so remember to "HUFF" - exhale on the stamp to re-moisten the ink - just before stamping. To make this card I cut a 4" strip from a piece of 12x12 cardstock. Score at 4" from each end. On the last section cut off a triangle from one corner up to the opposite corner by the score line. 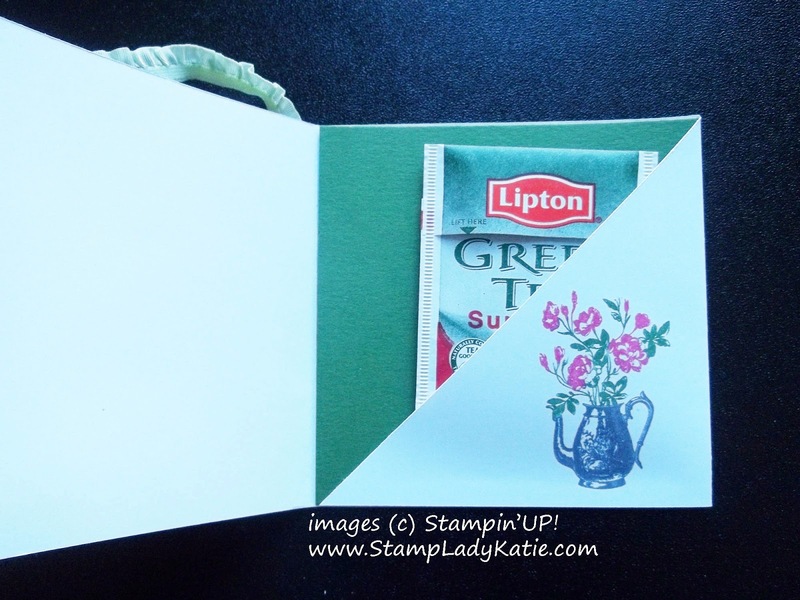 For stability I added a green 4"x4" sheet into the pocket with the teabag.